Imagine it is summer and you have wings. Just stretch them and fly and you can enjoy beautiful view on Albertov with its green parks and majestic Vysehrad. You say it is impossible. Because it is not summer now? Because you don’t have wings? Never mind, you can fly in our short video, shot from a small drone during the last summer. 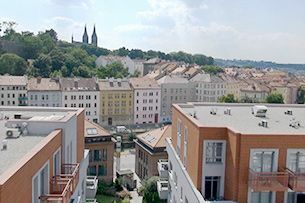 And feel how it is to fly and see the Albertov Rental Apartments complex from above, with so many nice apartments on one place in Prague. Which one to rent?